Tunic dresses are the ultimate in effortless chic attire, simply pop it on, look fabulous and off you go, they are must-have items for celebrities such as Fearne Cotton and Alexa Chung – these girls know how to rock the boho craze of tunic dresses perfectly! 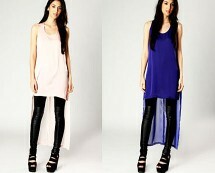 For a great style with ease, the tunic is the way forward for this season and will continue through till summer! This contrasting two tone tunic dress is bang on trend right now and looks extra stylish with zip detailing to the sleeves. 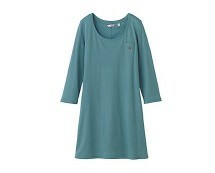 Tunic dresses are incredibly comfortable and easy to wear, and they suit almost anyone as they do not cling. This mini length cut is great for flashing the pins but for the less confident, it can be worn with tights and it will still look great! Team this fabulous tunic with towering heels to elongate the legs and add a clutch for nights on the tiles, otherwise dress it down with flat strappy sandals and oversized sunnies – perfect for summer!